It’s the time of year for late nights spent watching le Tour with Liggett and Sherwen reminding us how warm it is in the Northern Hemisphere. Indeed, in the midst of a Perth winter it can be a little hard to maintain the motivation to get out there on the bike. That’s where this recent conversion of ours comes in. The bike in question is a Lemond Alpe d’Huez; few names are as heavily steeped in the folklore of the Tour de France. Greg Lemond was a cycling legend, inspiring generations of elite American road cyclists and as for Alpe d’Huez, well, ask anyone who follows cycling and they’ll tell you just how many of the most captivating stages have traversed this grueling climb. Suffice it to say that this bike was a purpose built, lightweight road bike set up in singlespeed for simple, no nonsense performance and handling. 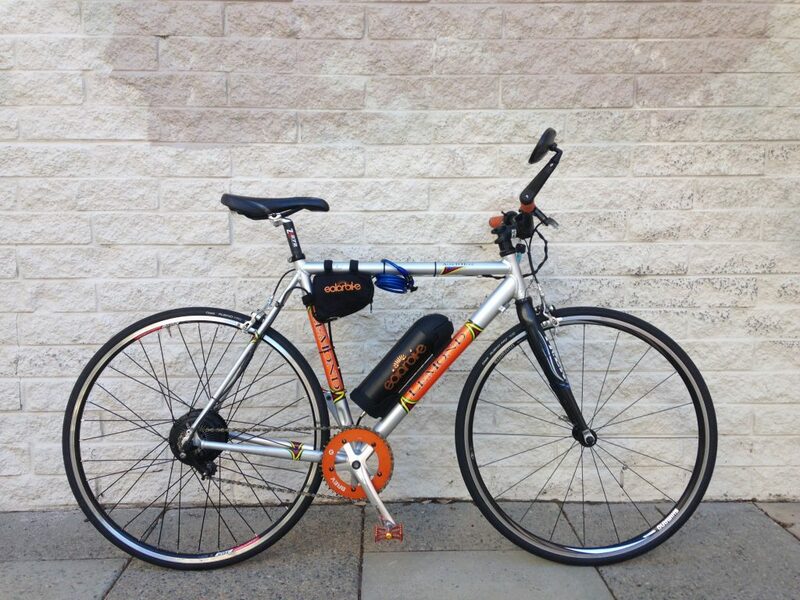 Its owner, Dennis, loved it, but wanted to take it on longer rides without worrying about getting caught out by the odd steep climb or brutal headwind that Perth bike commuters are all too familiar with. We fitted it with an electric conversion kit that was in keeping with the simplicity and performance of this bike. One of the lightest Electric Bikes we’ve set up, the Alpe D’Huez is sure to make hill climbing a breeze! Using one of our 700c Rear hub motor kits and a Panasonic 36V 9Ah tube battery we were able to convert this bike into a truly capable recreational road bike. Weighing in at under 16 kilos, it’s one of the lightest builds we’ve ever done which ensures good acceleration from the 250 Watt motor as well as a range of over 35 kilometres on a charge with light to moderate pedal input. As regular cyclists will tell you, staying on the bike during the winter can be a drag but it’s truly rewarding if you stick it out. So if you’re looking for something that’ll motivate you to keep riding even when the weather gets inclement, an electric conversion kit for your bike may be well worth considering!